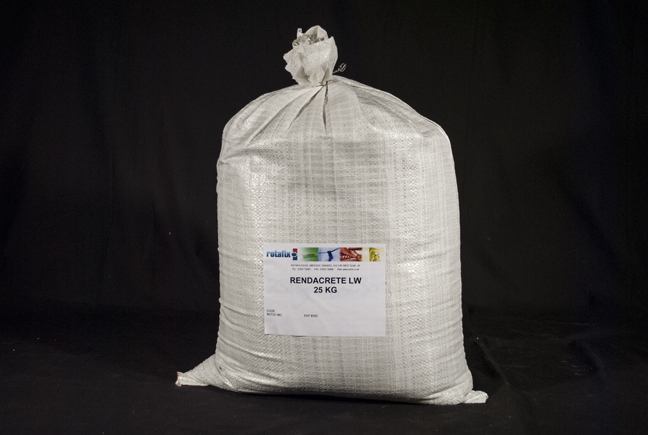 Rotafix Rendacrete Lightweight(LW) Concrete repair mortar is a mixture of cements, aggregates, accelerators, and polymers in one ready to use 25kg bag. By simply adding water to this premixed material you will get a consistent mortar, no more messing with admixes and fibres and getting inconsistent mixes and patchy repairs. Rotafix Rendacrete LW repair mortar is ideal for repair of damaged concrete surfaces. Rendacrete LW is a high build repair product so it is ideal for remedial works where the avoidance of shuttering can accelerate the progression of the repair. In high build situations for use in one application: 60mm or more on soffit surfaces, 75mm or more on vertical surfaces. Lightweight, low-density repairs are possible to cementitious materials, concrete, masonry, bricks, and blocks. Whenever a lightweight, non-flow material is required then Rendacrete LW is the reliable solution. Portland cement based, acrylic resin modified, micro silica-enhanced and fibre reinforced. Can be trowelled, floated, sprayed or placed by hand. The mortar “goes off” as “you go”. Early strength gain reduces time on site waiting for the material to “go off” making it easier to continue to repair the area. Rendacrete LW is an excellent insulator, but also a poor conductor of heat and sound. Fire resistant, non-combustible and it will not give off toxic gases. High build and high yielding: 1.300 tonnes yields 1m3 of mixed mortar. Economical, non-flammable, non-toxic, odour free, user-friendly and safe to use. It is recommended that it is used in conjunction with P12 Tack Primer to improve adhesion to the existing concrete structure.